An in-house fax server gives an IT department centralized management and monitoring over the entire enterprise's faxing. This can help your company track usage and better maintain records for auditing and record keeping. However, there are serious drawbacks that come with utilizing an in-house fax server solution and these range from security to cost-prohibitive pricing. 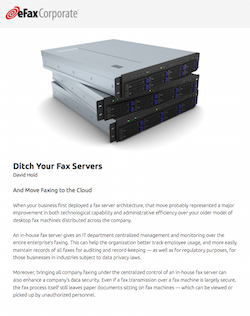 Make sure to download and read our guide on how you can Ditch Your Fax Servers and enjoy the benefits of cloud faxing.